If you’re a woman over 40 (the new 30!) you’ve probably begun experiencing some changes in your body and mind, perhaps having trouble sleeping, or maybe changes in mood. We’ve all heard of estrogen as a female hormone, and testosterone as a male hormone, but did you know that both are very important to women’s hormone balance? The key to aging gracefully is the balance of hormones which decrease as we age. The balance is very personal, not a one size fits all prescription of drugs, but a balance of the proper hormone dosages, along with appropriate nutrition and exercise. There are simple tests that can be done to determine the exact measurement needed for a healthy hormonal balance. Dr. Dalal Akoury and Dr. Pamela Smith are both experts in the field of anti-aging and metabolic medicine and offer all the information needed to make an informed decision for exploring the gift of aging and the beautiful balance needed to complete the symphony! Hormonal imbalances can occur at any age before, during, or after menopause and for a variety of reasons. While most hormone related problems are associated with menopause, fluctuating hormonal levels can also cause a variety of other conditions, and for some women, the effects can be truly debilitating. 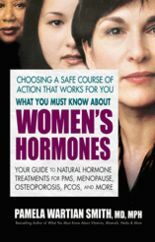 What You Must Know About Women s Hormones is a clear guide to the treatment of hormonal irregularities without the health risks associated with standard hormone replacement therapy. This book is divided into three parts. Part I describes the body s own hormones, looking at their functions and the problems that can occur if these hormones are not at optimal levels. Part II focuses on the most common problems that arise from hormonal imbalances, such as PMS, hot flashes, and endometriosis. Lastly, Part III details hormone replacement therapy, focusing on the difference between natural and synthetic hormone treatments. Whether you are looking for help with menopausal symptoms or you simply want to enjoy vibrant health, What You Must Know About Women s Hormones can make a profound difference in your life. Medical Center. She is a diplomat of the Board of the American Academy of Anti-Aging Physicians and is an internationally known speaker and author on the subject of Metabolic, Anti-Aging and Functional Medicine. She also holds a Master’s in Public Health Degree along with a Master’s Degree in Metabolic and Nutritional Science. She has been featured on CNN, PBS, and other television channels, has been interviewed in numerous consumer magazines,and has hosted her own radio show. She is currently the Director of the Center for Healthy Living and Longevity and the founder and Director of The Fellowship in Metabolic, Anti-Aging and Functional Medicine. Dr. Smith is also the director of the Master’s Program in Metabolic and Nutritional Medicine at the University of South Florida School of Medicine. She is the author of the best-selling books, HRT: The Answers, Vitamins Hype or Hope, Demystifying Weight Loss, What You Must Know About Vitamins, Minerals, Herbs & More, What You Must Know About Women’s Hormones, and Why You Can’t Lose Weight. Her newest book, How to Maintain Focus and Memory, is scheduled to be released in the Spring of 2013. Emerald Serenity Soap is filled with natural ingredients in a proprietary recipe developed by Dalal Akoury, MD and available exclusively at AWAREmed Health and Wellness Resource Center. Toxin free, it’s an amazing cleanser for the whole body, face, skin and hair. To order an 8 oz. or 16 oz. bottle of Emerald Serenity Soap contact AWAREmed Health and Wellness Resource Center at 843-213-1480 or email info@awaremed.com and use the code “NL4″ for a 10% discount!